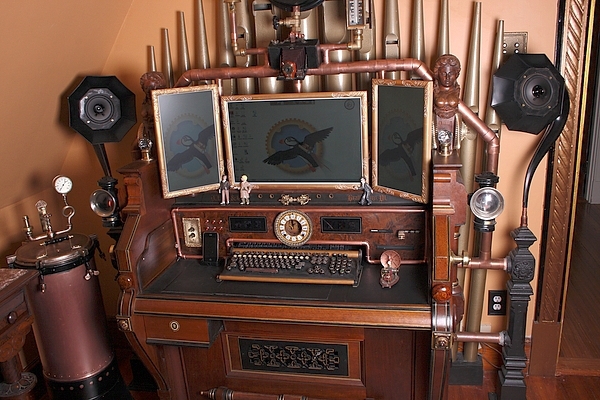 Seriously Steampunk Computer Envy | STEAMED! I am happy to oblige them. Lo and behold, I came upon some most excellent specimens. Such as the all-one desktop computer built as a mod by Jake Von Slatt or the utterly amazing full sized, wow-my-eyes-couldn’t-get-any-bigger-version by Bruce and Melanie Rosenbaum (who have completely done their house in steampunk finery which gives me yet more ideas for modifying the attic which will be our rec room/bar/guest room once the damn plaster dust settles (have I mentioned how much I hate sheetrocking?). 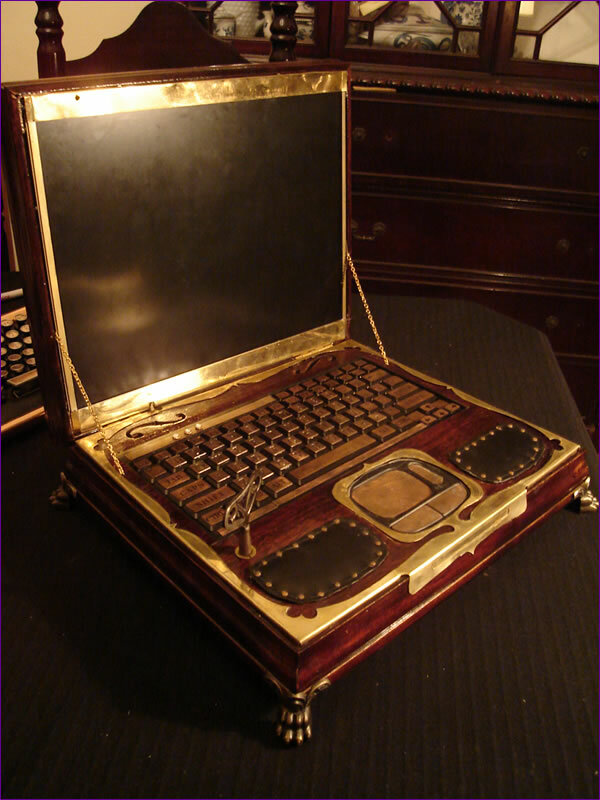 But then I absolutely fell in love with a laptop, which could not be finer in it’s steampunkery and clockwork-loving goodness. 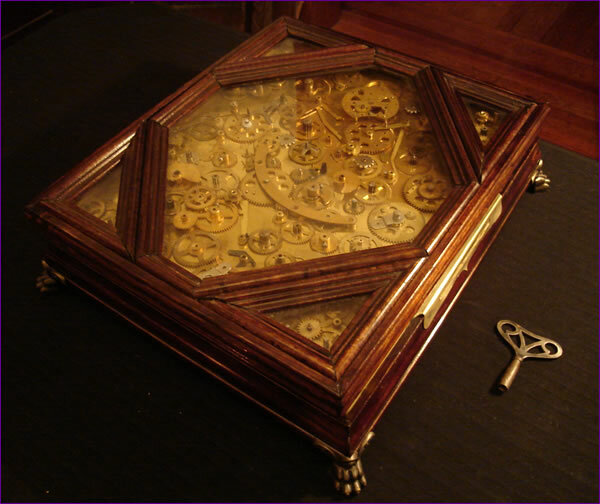 No, I know it looks like an incredible music box of some sort, but Datamancer.net has created this laptop that not only fully-functions, but literally has a clockwork mechanism that uses a key to turn the computer on! Talk about taking it to the next level. No simple switches here. 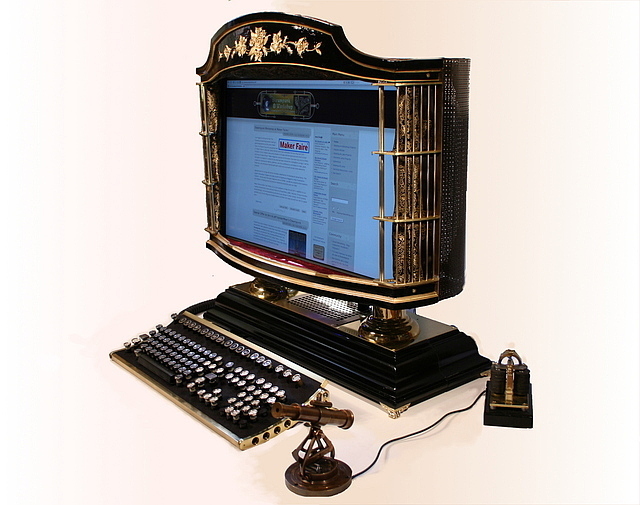 Clearly, if I want a computer with such steampunk savvy, I shall have to buy hubby a bandsaw for father’s day, learn to craft with brass and copper (beyond just using solder to fix copper pipes) and dip further into my creativity. Damn, you know, if I could only sew a computer this nice, I’d do it. But really, I’m thinking that pleats, buckles and brass buttons, with a fringe of lace aren’t going to do too well. *sigh* I suppose we all have our own talents. That’s why I’m going back to the keyboard. I have books to write. Awesome! I love all of those pieces. These are some amazing machines! Wish I could get one! That laptop is very cool! Very cool, Theresa. I love the laptop. Check out datamancer.net for keyboards, the laptop and other steampunk computer goodies.